About 3 years ago my teaching partner at the time, Amanda, made me the most amazing coconut cake for my birthday. I was hooked. She was kind enough to share the recipe with me which she discovered in one of her mom's old cookbooks. 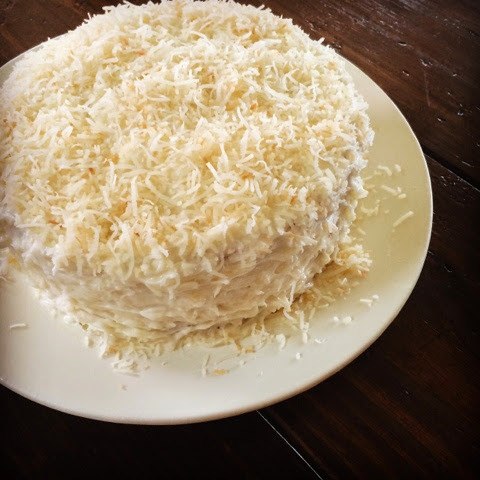 If you are looking for a moist and melt in your mouth coconut cake, you have to give this one a try. Note: I have made a few variations to the recipe but included the original at the very bottom of this post. * I try avoid vegetable oil at all costs and sub coconut oil. However, if you prefer, you can use 1/4 cup vegetable oil. 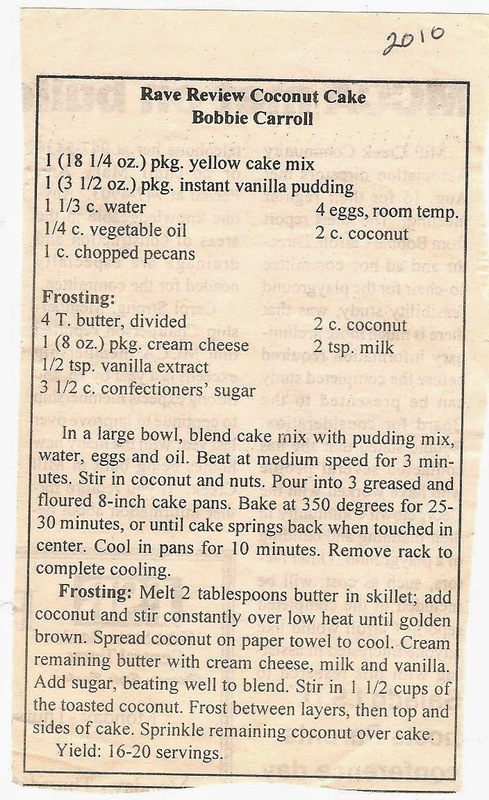 In a stand mixer, combine yellow cake mix, instant vanilla pudding, eggs, coconut oil and water. Mix on medium speed for 3 minutes. Bake at 350 degrees for 20-25 minutes. Do Not Over Bake! Turn out on cooling racks and allow to completely cool. While the cake is cooking, add 2 tbsp of butter to a pan and toast the shredded coconut. Be sure to continuously stir as once the toasting starts, it happens quickly. Spread out on wax paper or paper towel on the counter to cool. Cream the remaining butter, cream cheese, vanilla and 3 tbsp milk. Add the confectioners sugar 1 cup at a time scraping the side of bowl between each cup. If the icing is thick, add remaining 1 tbsp milk. Stir in 1 1/2 of the toasted coconut saving 1/2 a cup to sprinkle on top. Assemble layers adding icing I between each layer and finish by icing the entire cake. Sprinkle the remaining toasted coconut on top. Cover cake and place in refrigerator for a few hours to "set". I actually prefer this cake cold but it is delicious either way! Enjoy! I know my hubby is pumped to get to enjoy this sweet treat for Father's Day!